"The Motor Avenue Farmers' Market has transformed the area by providing a weekly community gathering place and easy access to fresh, local, and sustainably-farmed food. Its new and innovative Urban Garden Program takes the next logical step by educating our children and neighbors on the importance to our shared future of nutrition, sustainability and community cooperation." The Motor Avenue Farmers Market has developed an urban garden program to promote the health, synergy, and self-reliance of its local community. This program will have very specific and measurable benefits to our community. The Motor Avenue Improvement Association’s Farmers Market and Urban Garden Network has been successful in bringing local produce, food education, public open space and a sense of community to Palms, one of the densest neighborhoods in Los Angeles and top dozen in the United States. Recently Palms was ranked by the New York Times as one of the top ten places for young people to live but outdoor recreational space is severely limited. would be what’s called a “food desert”, meaning access to healthy, nutritious and local food is unavailable. We expanded our interest in heath education, recreational open space and community building with our Urban Garden Network. This expansion provides outdoor hands-on / active health education for school students and Palms residents by installing seven networked urban gardens throughout the neighborhood. Community involvement includes residents, businesses, farmers, and our local homeless and at-risk youth. They take part in tilling our urban gardens, garden mural program, cooking classes and more. 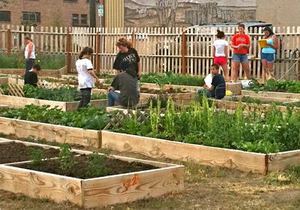 The Urban Garden Network has seven interconnected urban open space gardens, two garden parklets on Motor Avenue, two urban gardens on Motor Avenue and three local school gardens at Palms Elementary, Palms Middle and Overland Elementary. In partnership with Los Angeles Conservation Corps we are equipping the gardens with new fruit and vegetable seeds and seedlings, planter boxes, tools, decomposed granite paths, shaded teaching areas, additional seating, a secure storage shed, designated compost area and expanded drip irrigation. The program is expanding the school curriculum and the programming with the outdoor community Farmers Market: shadowing market vendors, farmer-lead classes, class fieldtrips to the vendors’ farms, and the chance for young gardeners to sell a portion of their crop at the market. To fight childhood obesity and promote a healthy, hands-on education, we’re incorporating these urban open space gardens into the regular curricula. Making the gardens more than just an elective activity allows for math, science, literacy, and life skills to be taught in a more engaging manner and will also ensure that the gardens are tended to regularly. All members of each garden have communal responsibility for one of the other seven gardens as well further ensuring the stability and success of all the gardens in the program. Most inner-city students and residents of Los Angeles never get the chance to see the connection between the farm and the supermarket. This is why we have scheduled fieldtrips for them to visit the very farms that participate in our market. Students will get to learn about larger scale organic farm practices and gain an appreciation for the particular community and labor involved in picking our food. By having students participate in the community, we get to show them that learning doesn’t exclusively happen in the classroom, and if they engage themselves, they can learn outdoors in nature. To test the efficacy of our program, we will conduct pre and post tests with students on core curriculum using the open space community gardens as an instructive tool as well as testing students on garden knowledge. Our intention in teaching multiple subjects via gardening is to increase the engagement and enthusiasm for knowledge that aids in data retention. This will be tested for its success by comparing the scores of exams with those of previous years before the gardens were implemented. Objectives are also measured in terms of numbers of participants both at schools and at community garden plots. And lastly, we measure the production levels of produce just like any other farm. Most school gardens go fallow during breaks and when the founding teacher or parent leaves or when no one is there to weed or water the plots – but this will not be a difficulty with our innovative interconnected program. To ensure the gardens are properly maintained, we have the participants of the urban gardens tend to the school plots during spring, summer, fall and winter breaks. The students and community share responsibility for all the gardens. Being part of a multiple community garden program ensures that the gardens are tended to regularly, and that the students and community have a sense of ownership for all gardens and for their community. Our two new Garden Parklets are part of the farm and nutrition theme of this program, including planter boxes and community recreation space. Both will be installed on Motor Avenue on both the north and south sides of National Boulevard in the heart of the Palms and Motor Ave business district. These Garden Parklets will be a wonderful addition to the Palms community considering that outdoor open recreation space is currently limited. The parklet will provide a perfect space for community members to utilize for growing of vegetables, recreational purposes and passersby to relax and enjoy Motor Avenue. The Mural Program will display interconnected farm-themed murals at each of seven garden sites. This project is a collaboration between community partners, schools, art academies, local graffiti artist, and Jane Seymour (artist/actress). 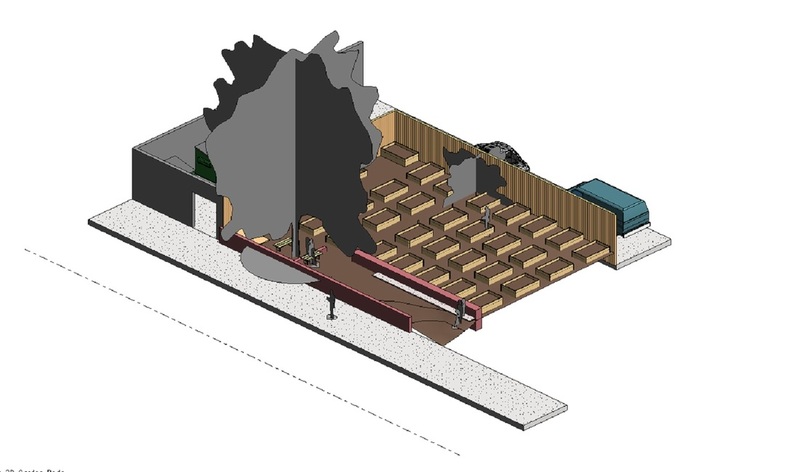 The murals will promote healthy living, nutrition, community, and the farm to table connection while tying in all seven open space gardens together. There will be an additional farm-based Mega Mural under the freeway overpass. Our gardens will be maintained as a community effort by students, teachers, and urban garden members. The benefit of having the urban gardens, parklets, farmers market and school gardens connected to each other is that no plot will be left unattended and community members can build a sense of dependability upon each other. This summer we have a group of student volunteers excited to come to school over the break just to tend to the garden they started this spring. We have a maintenance plan which includes: a regular watering schedule, maintenance days, drip irrigation installation and garden tutorial days with our community members. These tutorial days allow urban garden members and gardening instructors to join us this summer to help with school garden maintenance and to utilize the space for gardening classes. For example, we are hosting a class on installing timed drip irrigation so that plants will still receive water over any lapses of attendance such as school or holiday breaks. We are extremely excited about this garden network and hope you share in our enthusiasm. We strongly encourage your involvement in whatever capacity you see yourself fitting in. For more information, please contact us at market@motorassociation.org. Happy Gardening!